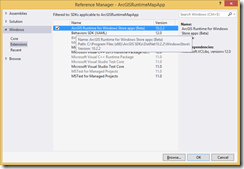 This is the first in a series of posts that will go over the new ArcGIS Runtime SDK. 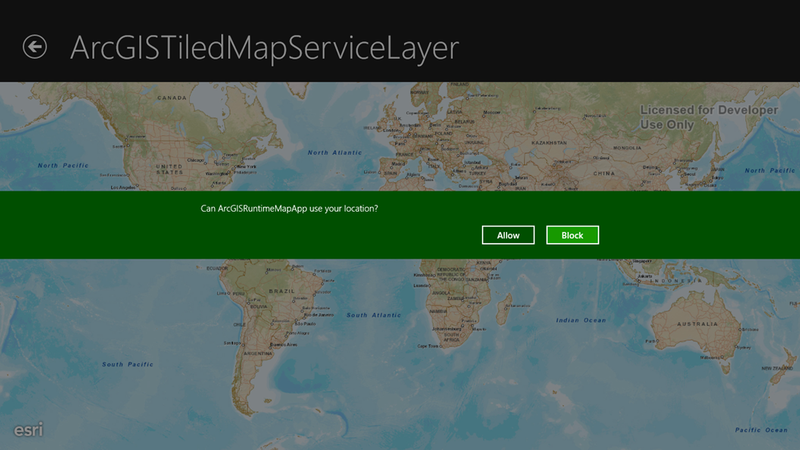 This first post will discuss how to get started and create an app that has the ArcGIS Runtime Map. This first step is to download the SDK. The SDK is currently in beta so you will need to sign up for the beta program. 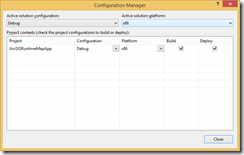 It’s important to note that you will not be able to get the SDK from nuget. 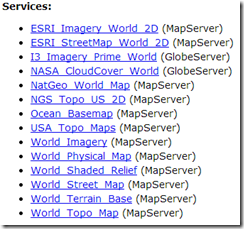 Esri packages their installers a little differently than you might be used it. The exe that you download is a zip of the actual installer. 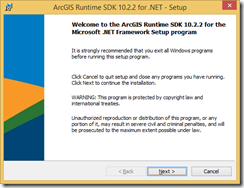 Run the ArcGIS_Runtime_SDK_for_DotNet_1022_536.exe (as of writing this the file is missing the exe extension, so you’ll need to add it) and you will be prompted for a location to unpackage the installer. Give it a location, once it completes it will run the actual Setup.exe. 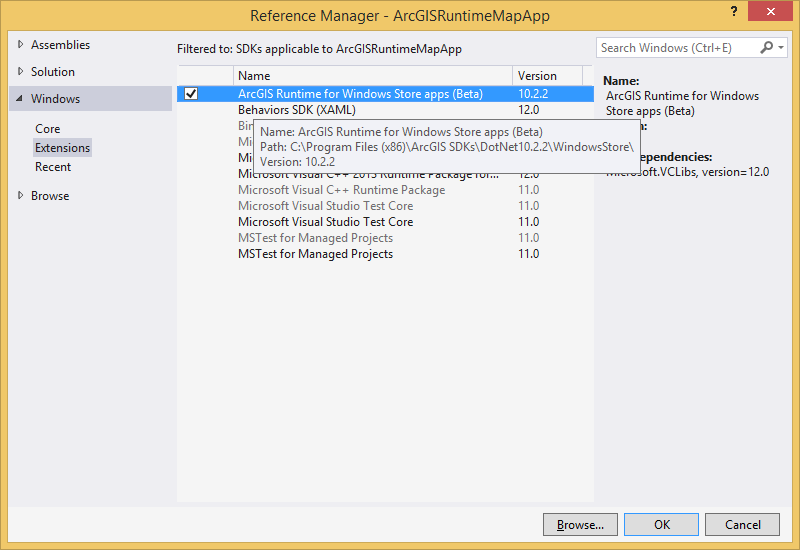 We’ll be building a Windows Store app with the SDK so you’ll need Visual Studio 2013. The SDK does not support Windows 8 apps, only Windows 8.1 apps. 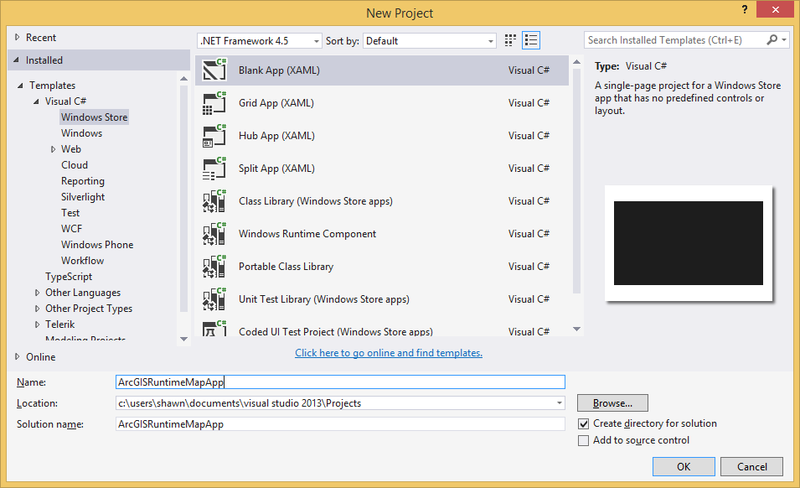 For Windows Phone and WPF you can use Visual Studio 2012. 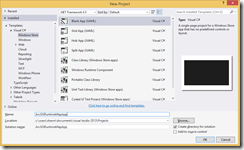 Open up Visual Studio and create a new Windows Store project. The core of the ArcGIS Runtime is built with C++. Because of this, you’ll need to change the platform of the application from Any CPU. Any CPU is a .NET only thing, so we’ll need to specify either x86, x64 or ARM. 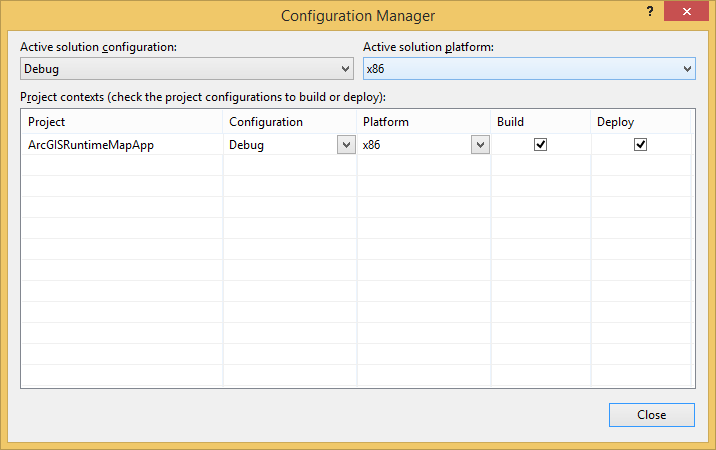 To change the platform right click on the solution and select Configuration Manager. You may also want to add the platform target dropdown to a toolbar..
Make sure that debug and release are set to something other than Any CPU. If you like using the designer, you need to pick x86. When you ship your app, you’ll package it up with x86, x64 and ARMso it will work on any Windows 8.1 device. Next add a reference to the new ArcGIS Runtime assembly. The assembly is under the Windows –> Extensions group. Open the XAML of your MainPage. For this example we’ll create a fully emersive mapping application. 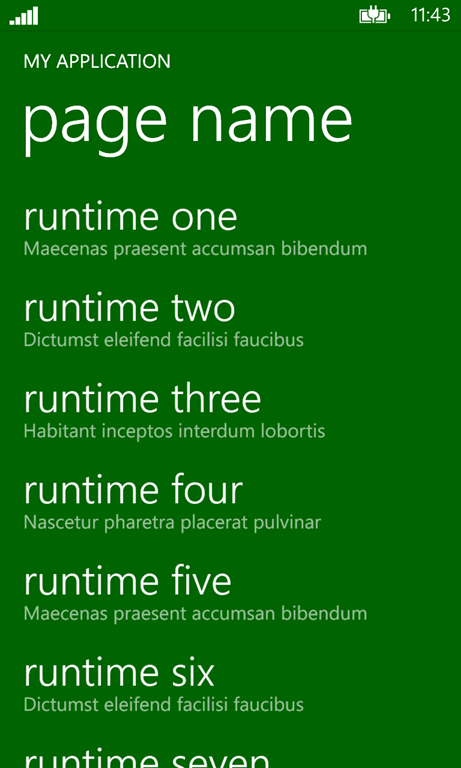 We’ll need to add two namespaces to our xaml. The esri namespace is where the controls live. This is where we will find the new MapView control. In the past, we have worked with Map control. Now the Map is a property of the MapView. This does seem odd as they have only pulled out the InitialExtent property and the Layers property. 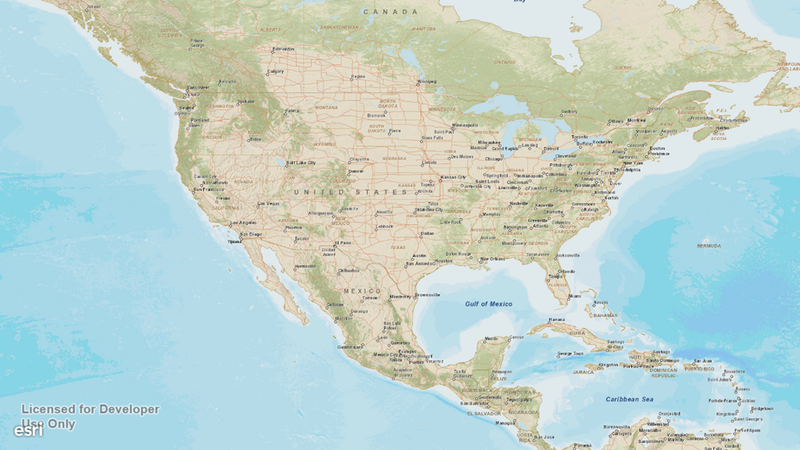 The rest of the map functionality still resides on the MapView. 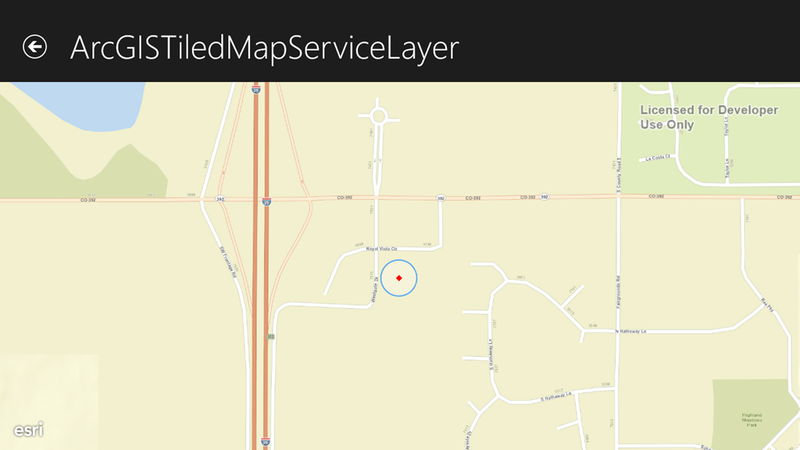 The layers namespace is where we will find the different types of layers we can to the map. The next post will have more information on the different layers. 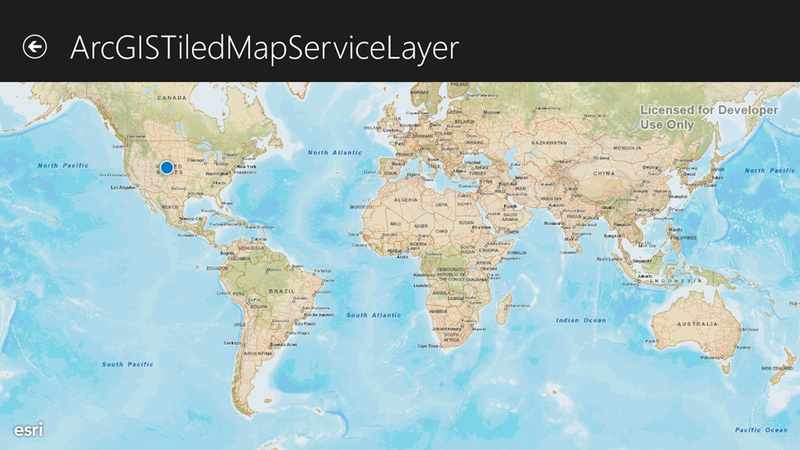 For this post we’ll use the ArcGISTilesMapServiceLayer using Esri’s free tiled map services. With the name spaces defined, add the following XAML your page. Run the application and you’ll have a map app! Pan, zoom around. Find your home, have fun! As you can see it is pretty simple to get started with the ArcGIS Runtime SDK. In the next post I’ll cover the different layers in the SDK. You can download this solution that also contains a Windows Phone 8 app as well! 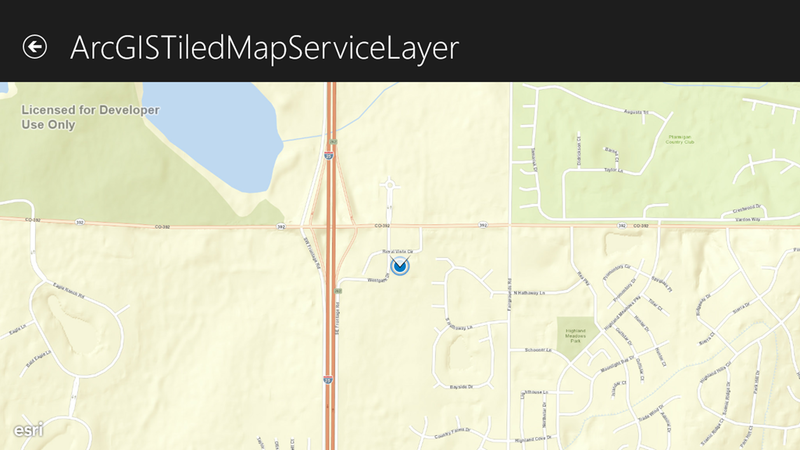 Last Sunday (March 9) Esri announced the public beta release of their mapping SDK for .NET. 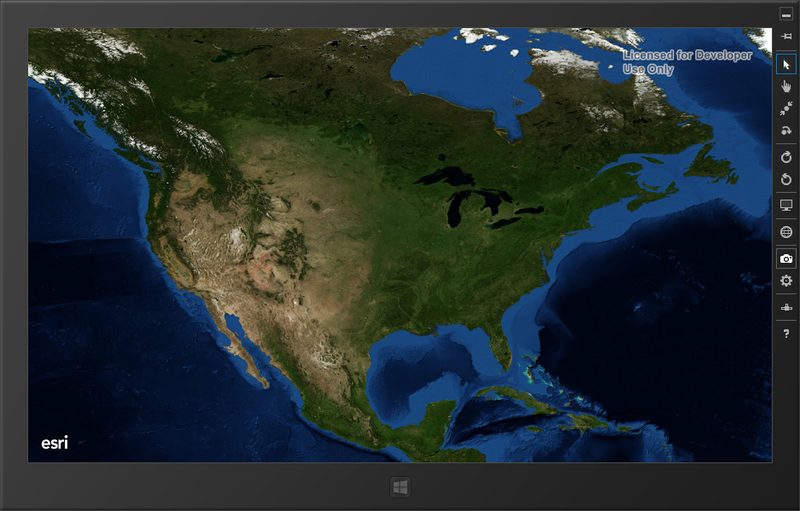 This new SDK covers Windows Store, Windows Phone, and WPF. Can you believe it? All three platforms, and all using the same API. This is huge news if you develop mapping applications. 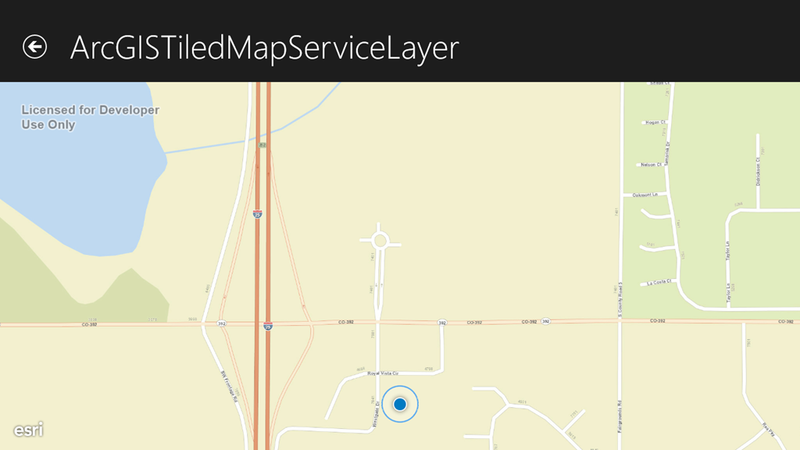 Personally I find it painful that in Windows Phone 7 you would use the Bing Maps (Silverlight) SDK. In Windows Phone 8 you were encouraged to use the new Nokia Maps SDK, while on Windows Store you had the Bing Maps SDK, but it was a different SDK than the Windows Phone 7 one. So that’s three different SDKs to use. I have no idea who thought this was a sane idea. 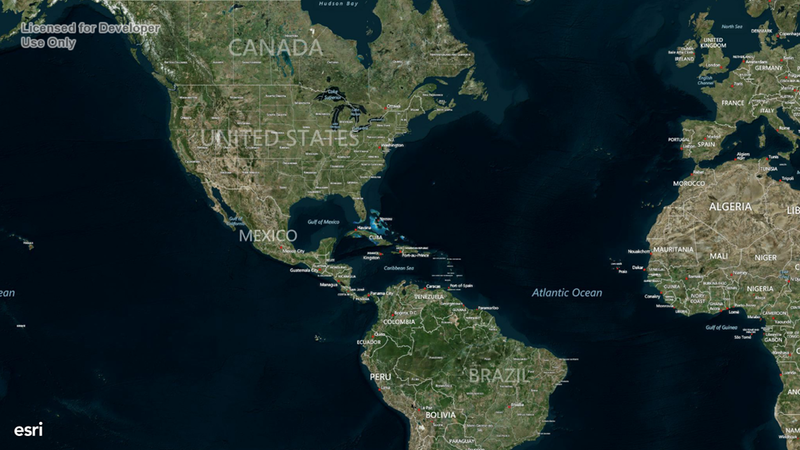 Esri has been working hard on this new SDK. 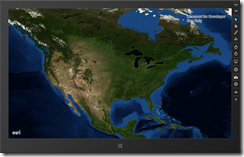 During the Devsummit last year (2014), Esri announced the beta of a new SDK that would target Windows Store. At that time, they already had a Windows Phone SDK and a WPF SDK. Both were very similar with a few extras on the WPF side. While working on this new beta for Windows Store, they decided it would be much better to have a new SDK that targeted Phone, Store, and WPF. So for the past year that’s what they have been doing. 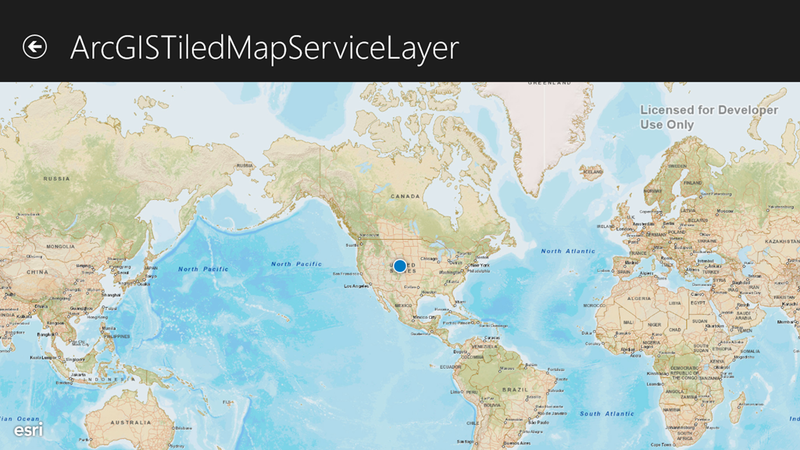 Over the coming weeks I’ll be blogging about how you can create mapping apps that use this new SDK. Some of these blogs will have a heavy focus on the GIS person, while others will be targeted to everyday app builders who want a better experience building map apps. These blogs will focus on Windows Store, but can be applied to Windows Phone and WPF as well. I have seen a lot of apps recently in which the developers think about the theme of their app. They have nice colors, either in text, or background or both. Sidebar: I recently read in an MSDN blog that “Backgrounds are discouraged. They are allowed for brand reasons and to support contrast. Instead, use any accent colors on the text foreground”. I personally like when apps do this rather than just the plain white or black text/background offered by default. This makes the app stand out from the rest. Heck, even Microsoft has violated this rule with their bing apps. I have a dark theme for my phone, yet the bing apps seem to favor a white background. One area I notice where people are not applying their theme is in the system tray. They spend a lot of time and effort theming their pages, yet neglect this area. This is actually not surprising as the system tray is easy to overlook when creating your apps. It is placed in by default, it’s very small (32 pixels), and when using the emulator it’s hard to distinguish the tray from the emulator. Forgetting to theme this part of your app results in the following. Notice the black bar at the top? How can you fix this? There are a couple ways to add your theme to the system tray. The simplest way to extend your theme into the system tray is to change the BackgroundColor. Let’s take a look at what happens to your app style when changing the color. Notice anything off? Let me zoom in a little. Notice the black line between the tray and the page content? This happens if you set the background through the PhoneApplicationFrame, or through the page content. If you are setting the background from the frame there is no way to remove the black line. If you set the background color from the page content, then you can remove the black line by shifting your page content up by one pixel. Unfortunately this means that you have to set the background for every page, rather than once in the frame. A second option is to change the Opacity of the SystemTray. Opacity behaves very differently for the phone shell controls (eg: SystemTray, ApplicationBar) than it does for XAML controls. 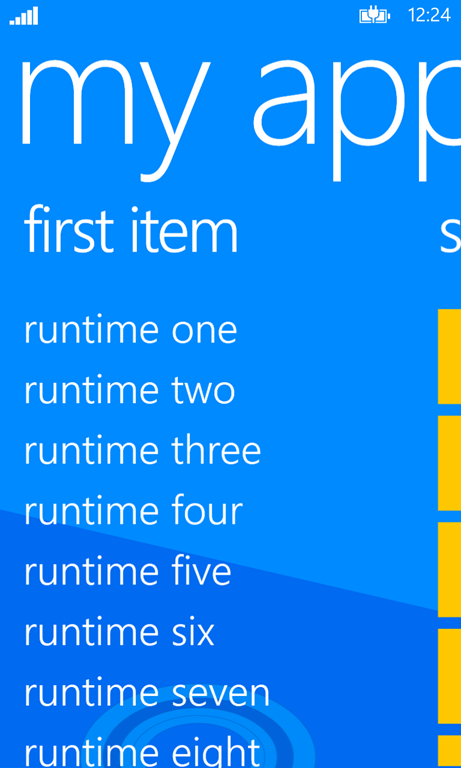 In XAML, opacity defines if an item should have some transparency (ie: Change the alpha channel). In Shell controls, opacity also defines the transparency but it is quite different. Setting a value less than one does not cause the content of the tray to become opaque. Instead it changes opacity of the background color. Changing the opacity also allows controls to move into the space of the tray. Think of opacity on shell items like a grid with two rows. When opacity is set to “1” (the default), the tray and the page content fill only one row each. When opacity is less than one, the page content is allowed to be in both rows. This causes your entire page to shift up! Shifting your content up means that your page is not quite aligned anymore. To fix this, we’ll need to take into account whether the background for the page was set through the PhoneApplicationFrame, or through the page content. With either approach, we will add a top margin of 32. Which approach is used determines where we place the margin. If you set the background of the PhoneApplicationFrame, you can safely add a margin to the first child of your pages. The background of the frame will fill the entire phone screen while your page content is shifted down slightly. If you set the background of your page, you will want to add another child control to your LayoutRoot grid. If your pages have a Panorama with a background set you’ll want to modify the style to ensure that title does overlap the tray. The following image is using the default Panorama App template. The only change was to set visible to true, and opacity to 0. The app has the exact same look without needing to add any margins. This gives the user the benefit of the system tray, without taking space from your app! Using this approach how do you have a different color for the tray area than you do for the page content? You can accomplishing this by placing grid inside your page that has the background set. With this approach, you’ll need to take into account the margin. So which approach do I recommend? Changing the BackgroundColor or the Opacity of the tray? Sorry, but going to answer “it depends”. It depends on how you want your page transitions to function, It depends on whether you want a different color for your tray than for your pages. Pick the solution that works best for you. For either solution I highly recommend setting the background of the PhoneApplicationFrame rather than the background of your page content. Setting the background of the frame allows page transitions to flow without showing the phone background (white or black) between pages. I do recommend that you show the system tray, especially if your app uses an internet connection. If your app is loading slow, users will wonder if they have a good connection. They will want to tap the tray to see if they have a good cell signal or are connected to WiFi. If you hide the tray, the user has no idea if they are connected without exiting your app. You can always shift up your content closer to the tray in order to show more content. You can also place your app title in the system tray. NOTE: All of this also applies to the ApplicationBar!